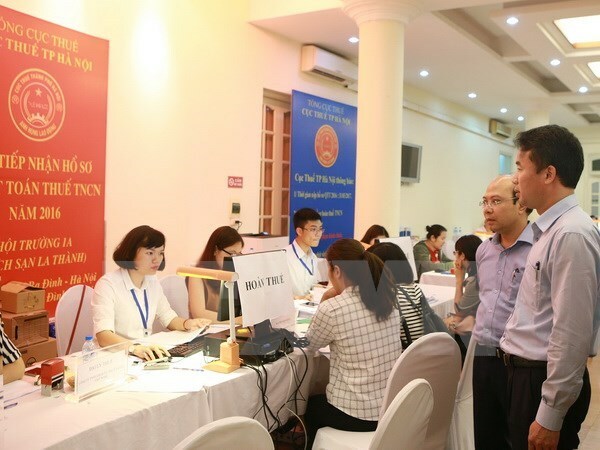 Hanoi (VNA) – The Hanoi Taxation Department shared information about tax policies of Vietnam and Hanoi in particular with the Japanese firms operating in the capital city during a seminar on August 10. Speaking at the event, Deputy General Director of Taxation and Director of the Hanoi Taxation Department Nguyen The Manh said the event aims to promptly deal with arising obstacles in the process of adopting tax policies targeting the Japanese enterprises. Several Japanese investors spoke of tax policy flaws involving transfer pricing, franchising, added value tax software, corporate and individual income tax, and special consumption tax. A representative from the Japan Business Association in Vietnam said the association will continue acquiring Japanese firms’ feedback on tax policies and working behaviours of tax officials and cadres to report to the Hanoi Taxation Department. In recent years, the Japanese businesses’ revenue to the Hanoi’s State budget has accounted for nearly 30 percent of the total paid by foreign-invested ones. In 2016, Japanese firms contributed 4,819 billion VND (209.5 million USD) to the city’s budget. The figure rose to 2,854 billion VND (124 million USD) in the first half this year, up 23 percent annually.